This partnered post is brought to you as part of my Denny’s Ambassadorship. All opinions are honest and are my own. We love family nights. We typically have ours on a Friday or Saturday night, and ending the week spending quality time together is just the best. It’s a time to unwind and talk about our week, and it’s a great time to reconnect after a busy five days. I’ve got a fun plan for our upcoming family night, and I thought I’d share it with y’all in case you’d like to do this, too. It’s simple, inexpensive, and fun for the whole family – can’t really beat that. 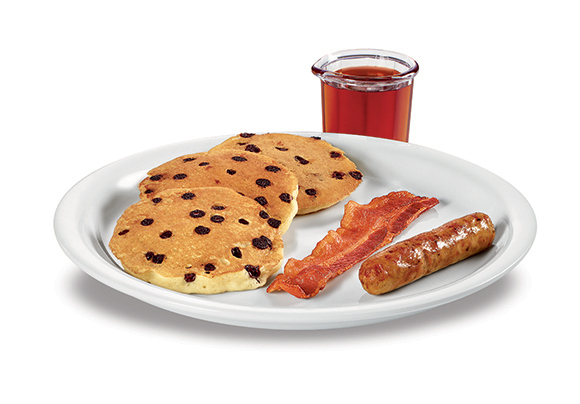 Saturday nights at our Denny’s are free kids meal nights, which means our family of five can eat for $20 or less. I love that, because with three kids our costs for dining out can quickly skyrocket. For our family fun night, we’ll go eat at Denny’s for an early dinner. 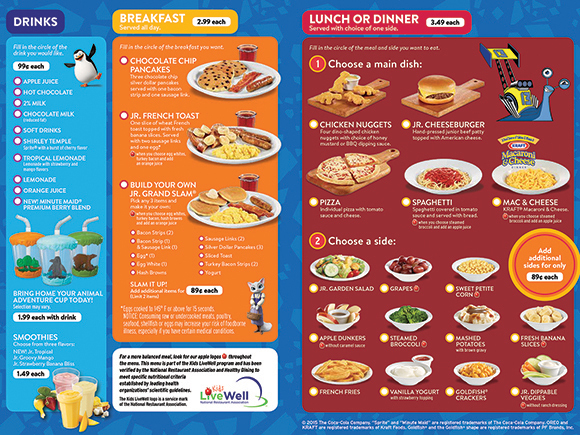 Our kids love choosing their meals off the kids menu, and they actually eat really well, which is an added bonus (I’m sure many of you can relate to having some picky eaters in the house)!Another thing I love about the Denny’s kids menu is that I can add on extra sides for just 89 cents. So instead of them having to pick between french fries or corn (hmm… which do you think will win?) I can compromise by letting them get fries as long as they pick another side to go with it, too. Of course, they often pick breakfast – I think their favorite thing to get is the chocolate chip pancakes, and then we can add on a side of yogurt or banana slices. 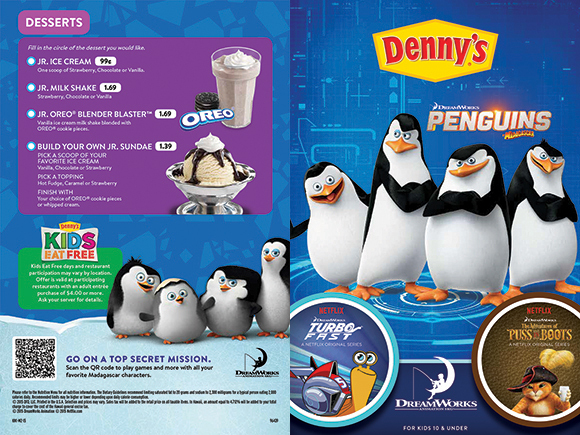 Right now Denny’s is partnering with DreamWorks Animation, and their kids menus reflect that – our kids will be thrilled because we’re big fans of many DreamWorks movies! The menu not only has the characters interspersed with the food – it’s got fun games and activities you can do with your family around the table, like this one below. Can you find the differences? Our family loves doing things like this, and I love the idea of working together to solve the puzzle of finding all the changes between the images. Another aspect of these kids menus that I just think is SO cool is the DreamWorks COLOR app. Your kids can color the DreamWorks characters featured on the kids menu, and then use the app to bring their drawings to life, making them 3-dimensional. Our kids will absolutely have a blast with that. To download the app, just go to www.dreamworkscolor.com on your phone. After going to Denny’s and having fun with all the DreamWorks activities, we’re going to continue the theme with a family movie night at home. We’ve never seen Penguins, but the kids loved Madagascar, so I think that’ll be the movie of choice. We’ll stock up on a few candies and pop some popcorn before we snuggle up on the couch to watch the movie. Doesn’t that sound like a great family night? I love that it’s completely affordable, too. You can watch a movie you already own (we own How to Train Your Dragons, for instance) or can typically find them available for rent as low as $1. Add in a little candy and popcorn and you can still keep the cost for the whole evening around $25 dollars including dinner! 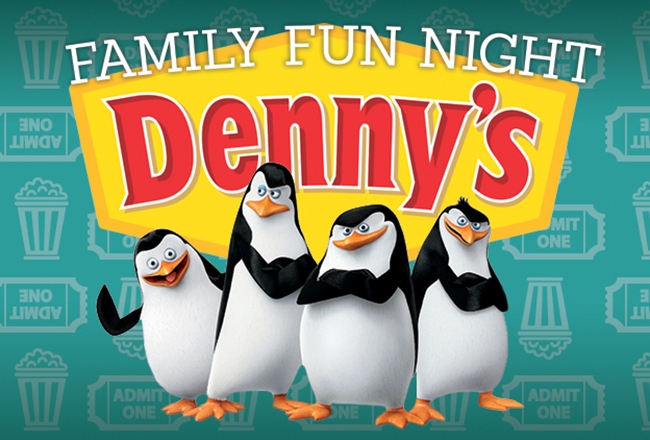 Thanks to Denny’s, though, you might get to experience your family night for free! Just sign up below; you’ll be entered to win a $20 Denny’s gift card and a DreamWorks DVD/BluRay. I’ll even add in $5 via PayPal so you can get some candy for the evening, too. 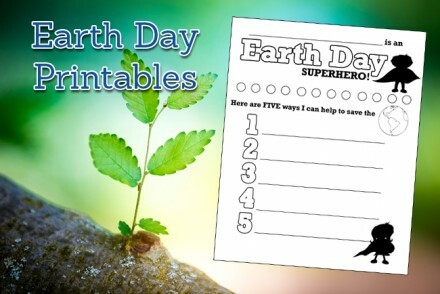 Earth Day Activity & Free Printable – Earth Day Superhero! That sounds like a ton of fun. Denny’s has delicious food, and anything involving Dreamworks is going to be a blast. I love Denny’s, but sadly we don;t have one near us. I sooo wish we did. Whenever we see one when we’re traveling, we always stop. My son loves this movie! We showed it to him a few weeks ago and that is all he talks about. Thanks for sharing. I like Shrek and the Grand Slam. I always get the pancakes , eggs and bacon. I haven’t been to Denny’s in a long time, but I always loved their breakfasts! There are so many great Dreamworks movies that it would be hard to pick a favorite. I do love Madagascar though. I have only eaten at Denny’s once when we were in Florida. We don’t have one around here in our area. This looks like a great way to spend time with your family. We have been enjoying the food at Denny’s for years. They have the best menu. There is something for everyone. I am not entering because sadly I do not have a Denny’s anywhere near me, I wish I did though! We have two boys who like watching movies at home (not the theatre)…we need to wiggle and take breaks. Also, we love Denny’s! We would be delighted to win this package. All-American Slam is my favorite menu item! How to Train Your Dragon is one of my favorite DreamWorks films. Yum! I love love love me some Denny’s. And thanks so much for the opportunity to win! Great giveaway! How fun! I love Dennys. Haven’t been to one in years. Would love to head on over for some great food! My kids love it too! I have never been to Denny’s— hopefully sometime on vacation we will get to stop at one. Kung Fu Panda is my favorite DreamWorks movie. I am so sad that we don’t have a Denny’s near us. When I lived in Maryland for about a year when I was 19, we ate there pretty much every night! They have such great food and affordable prices. We have a Denny’s right down the road and I can’t believe we haven’t been yet. I will have to go and see their kids menus. We all love the pancakes, and we like Madagascar, seen it over and over. 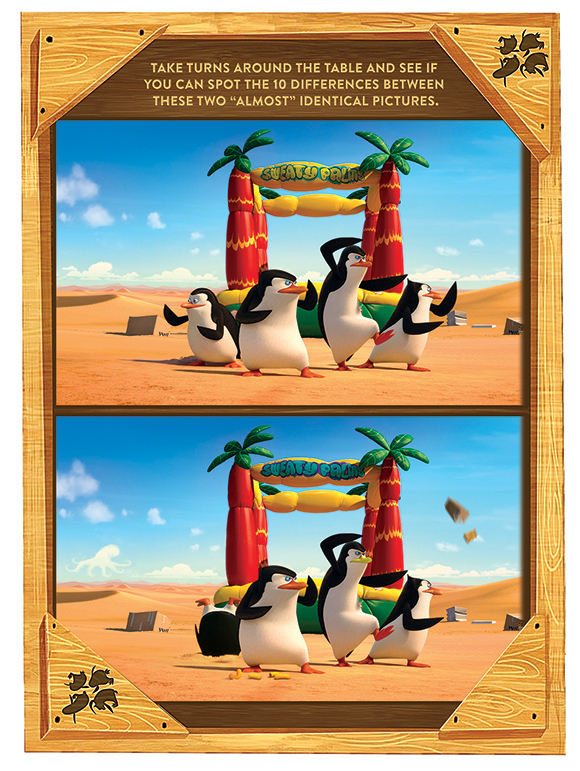 This looks like a lot of fun, my kids love Denny’s and Penguins of Madagascar. Thank you for the giveaway good luck everyone! We often avoid eating out due to the cost as well, but with a free kids meal how can you go wrong? That app is amazing, my daughter would absolutely love that, I have to download it! I like the Ham & Cheese Omelette, I have always liked the movie Shrek but Home is pretty good too. Denny’s has long been my fav place to go after a long night of partying! We go to Denny’s often (maybe too often). My kiddos enjoy the variety of meals that are available to them. My daughter loves the goldfish and my 0ldest son loves the pizza. My youngest son will eat anything! My fave has always been their giant steak fries. They are just not the same anywhere else. My favorite DreamWorks movie is Rise of the Guardians. I love Dennys and their extensive menu. I have two teenagers so I couldn’t eat for $20 or less depending on what they pick. I love the 2,4,6,8 choices too. I’m sad that they closed our Dennys. This sounds like it would be a nice family fun night! It’s been a while since we;ve been to a Denny’s so this sounds like fun! Yum! Love Denny’s! Would be so happy to win this one! I think we’ve only been to Denny’s once since I got here in the U.S. And we haven’t been there in a while. We have to go back soon. When I lived in Atlanta, we used to eat at Denny’s all the time. We had a location nearby our house, so it was super convenient. This is such a great giveaway! Love the grand slam breakfast and shrek. I like Denny’s Chicken Strips. I actually really love Denny’s! They have really great breakfast food! And I love a good giveaway! I love their chicken tenders. My favorite dreamworks movies is Shrek. My favorite is the Grand Slam Breakfast. i love the Denny’s grand slam but they also have a Cobb salad that is really good too! This is so cool. A denny’s just opened nearby so we will definitely be taking part in our own family fun night. Love the Grand Slam Breakfast and Shrek is my favorite. I love that Denny’s and DreamWorks teamed up! Thanks so much for this wonderful giveaway! omg Denny’s!!!! I never even use to thing about Denny’s because I always lived near one. Now that I’m in a Denny’s-less town… Ughhhh… I miss it!!!! OMG Dennys! The only place I can get a peanut butter milkshake made to perfection no matter the location. That place rocks! I didn’t know they had free meals for children. So cool.